This article is about Sichuan pepper or Chinese pepper. For Japanese pepper, see sanshō (spice). While the exact flavour and composition of different species from the genus Zanthoxylum vary, most share the same essential characteristics. So while the terms "Sichuan pepper" and sanshō may refer specifically to Z. simulans and Z. piperitum, respectively, the two are commonly used interchangeably. The Sichuan pepper is known in Chinese as huā jiāo. A lesser-used name is shān jiāo (山椒, not to be confused with Tasmanian mountain pepper, which is also the root of the Japanese sanshō (山椒)). Confusingly, the Korean sancho (산초, 山椒) refers to a different if related species (Z. schinifolium), while Z. piperitum is known as chopi (초피). 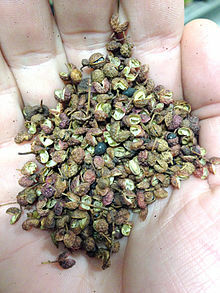 The Indian subcontinent uses a number of varieties of Sichuan pepper. In Konkani, it is known as tephal or tirphal. In Nepali, Z. alatum is known as timur (टिमुर) or timbur, while in Tibetan, it is known as yer ma (གཡེར་མ) and in Bhutan as thingye. It is also called current mirchi commonly. In Indonesia's North Sumatra province, around Lake Toba, Z. acanthopodium is known as andaliman in the Batak Toba language and tuba in the Batak Karo language. In America, names such as "Szechwan pepper", "Chinese pepper", "Japanese pepper", "aniseed pepper", "sprice pepper", "Chinese prickly-ash", "fagara," "sansho", "Nepal pepper", "Indonesian lemon pepper", and others are used, sometimes referring to specific species within this group, since this plant is not well known enough in the West to have an established name. Some brands also use the English description "dehydrated prickly ash", since the Sichuan pepper and Japanese sansho are from related plants that are sometimes called prickly ash because of their thorns (though purveyors in the US do sell native prickly ash species (Z. americanum) because it is recognized as a folk remedy). In Kachin State of Myanmar, the Jinghpaw people widely use it in traditional cuisine. It is known as ma chyang among them. Its leaves are served as one of ingredients in cooking soups. Recipes often suggest lightly toasting the tiny seed pods, then crushing them before adding them to food. Only the husks are used; the shiny black seeds are discarded or ignored as they have a very gritty, sand-like texture. The spice is generally added at the last moment. Star anise and ginger are often used with it in spicy Sichuan cuisine. It has an alkaline pH and a numbing effect on the lips when eaten in larger doses. Ma la sauce (Chinese: 麻辣; pinyin: málà; literally "numbing and spicy"), common in Sichuan cooking, is a combination of Sichuan pepper and chili pepper, and it is a key ingredient in má là hot pot, the Sichuan version of the traditional Chinese dish. It is also a common flavouring in Sichuan baked goods such as sweetened cakes and biscuits. Beijing microbrewery Great Leap Brewing uses Sichuan peppercorns, offset by honey, as a flavouring adjunct in its Honey Ma Blonde. Sichuan pepper is also available as an oil (Chinese: 花椒油, marketed as either "Sichuan pepper oil", "Bunge prickly ash oil", or "huajiao oil"). In this form, it is best used in stir-fry noodle dishes without hot spices. The recipe may include ginger oil and brown sugar cooked with a base of noodles and vegetables, then adding rice vinegar and Sichuan pepper oil after cooking. Hua jiao yan (simplified Chinese: 花椒盐; traditional Chinese: 花椒鹽; pinyin: huājiāoyán) is a mixture of salt and Sichuan pepper, toasted and browned in a wok, and served as a condiment to accompany chicken, duck, and pork dishes. The peppercorns can also be lightly fried to make a spicy oil with various uses. From 1968 to 2005, the United States Food and Drug Administration banned the importation of Sichuan peppercorns because they were found to be capable of carrying citrus canker (as the tree is in the same family, Rutaceae, as the genus Citrus). This bacterial disease, which is very difficult to control, could potentially harm the foliage and fruit of citrus crops in the U.S. It was never an issue of harm in human consumption. The import ban was only loosely enforced until 2002. In 2005, the USDA and FDA lifted the ban, provided the peppercorns are heated for ten minutes to around 70 °C (158 °F) to kill any canker bacteria before import. ^ Diacono, Mark (13 December 2010). "How to grow Szechuan pepper and make Chinese five spice". the Guardian. Retrieved 20 March 2018. ^ Johnson, Elaine. These Asian spices are lively secrets. Sunset, 1 March 1993. ^ a b c d Katzer, Gernot. "Spice Pages: Sichuan Pepper (Zanthoxylum, Szechwan peppercorn, fagara, hua jiao, sansho 山椒, timur, andaliman, tirphal)". gernot-katzers-spice-pages.com. Retrieved 20 March 2018. ^ "Mistress of Spices – Teppal or Tirphal". aayisrecipes.com. 3 June 2006. Retrieved 20 March 2018. ^ McGee, Harold (2007). On Food and Cooking: The Science and Lore of the Kitchen. New York: Scribner. p. 429. ISBN 978-1-4165-5637-4. ^ Levine, Jonathan (June 20, 2013). "Beijing's microbrewery boom". CNN. Retrieved May 13, 2015. ^ "eCFR — Code of Federal Regulations". www.ecfr.gov. Retrieved 20 March 2018. ^ Landis, Denise (4 February 2004). "Sichuan's Signature Fire Is Going Out. Or Is It?". The New York Times. p. F1. ^ "China's Sichuan Peppercorns -- Banned From the US No More - USDA". www.usda.gov. 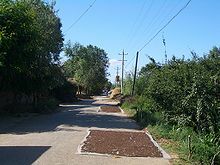 Wikimedia Commons has media related to Sichuan pepper.